Firefighters battle a fire at a fabric plant in Boyle Heights. A large fire engulfed a fabric plant in Boyle Heights in Los Angeles, CA, officials said. 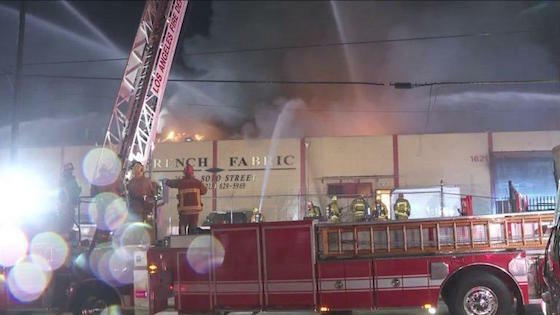 Los Angeles firefighters got the call to the 1600 block of Soto Street around 6:43 p.m. Oct. 15, where they found French Fabrics, a 300-foot by 400-foot commercial building, engulfed in flames, the department said. The fire was burning through the roof and firefighters ended up forced to conduct a defensive operation due to high voltage power lines nearby. The fire was declared knocked down at 8:58 p.m.